You might have seen many LEGO robots that can sort parts by color, but few robots can sort LEGO parts by size. 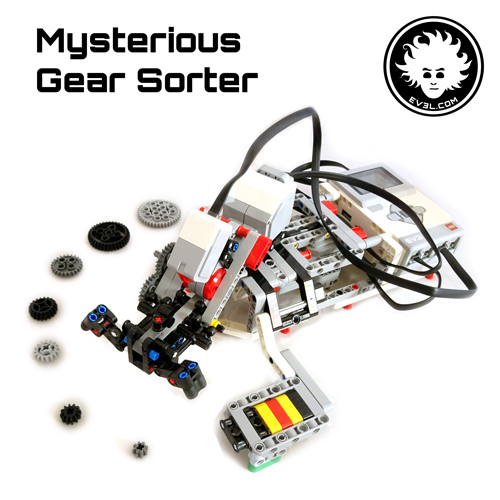 This pick and place robot arm can measure the number of teeth of the gears in a unique and baffling way, that’s why I named it the Mysterious Gear Sorter. Can you guess how does it work? Are you curious to discover the trick? Click on the button below, and build this pick and place robot arm with a single LEGO MINDSTORMS Education EV3 set 45544. This Gear Sorter is ready to go! The .EV3 project file that comes with the commercial license includes the complete EV3 program. The quality of the building instructions is comparable to the LEGO official ones . The building and programming instructions are detailed and clear. This pick and place robot arm can be built with the parts from LEGO MINDSTORMS Education EV3 set 45544. You cannot share, resell or redistribute the material in any way with third parties. You cannot use the material for other uses than the one allowed by your license. The material comes encrypted and protected, and cannot be extracted or transformed. Any infringment to the above terms is considered a punishable criminal offence. This robot shares the base structure of the official LEGO Robot Arm H-25. The instructions are inside the EV3 Software Education, but you can also get them from the link below.